Erik Jones starts the Cup Series Playoffs hunt with a pole for the South Point 400. Photo by Rachel Myers for Speedway Media. Erik Jones will kick off the playoffs by winning the pole for Sunday’s Inaugural South Point 400 at Las Vegas Motor Speedway in the NASCAR Monster Energy Cup Series at 188.121 mph in 28.705 seconds. Joey Logano was 0.003 seconds off the top spot, and will start on Jones’s outside. Both drivers were the only competitors to run a 188 mph average speed in the final stage of qualifying. 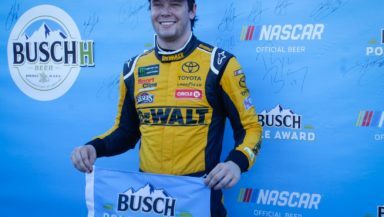 Denny Hamlin and Kyle Busch, who was hundredths of a second from being eliminated in the first round of qualifying, wound up third and fourth in the final stage of qualifying. Kevin Harvick was the only one of the “Big 3” to consistently run up front in all three stages of qualifying and will start fifth. The rest of the final stage results for positions six through twelve went to Ryan Blaney, Chase Elliott, Kurt Busch, Alex Bowman, Martin Truex Jr., Kyle Larson and Jamie McMurray, the only non-Playoff contender in the final stage of qualifying. In the first stage of qualifying, Kevin Harvick held the top spot over Joey Logano, Alex Bowman, Kyle Larson and Client Bowyer. All playoff drivers made it to Round 2, but Kyle Busch bobbles in the middle of 3 and 4, almost costing him as he finishes 24th in the first round, barely edging out Regan Smith and Matt DiBenedetto. The second stage had Erik Jones at the top of the charts with a slightly slower time than the first stage. Harvick, Logano, Hamlin and Larson was the top five positions going into the final stage. The Playoff drivers eliminated at the second stage were Brad Keselowski, Clint Bowyer, Aric Almirola, Jimmie Johnson and Austin Dillon.